After her complaint triggered protests, Franco Mulakkal was arrested in September. Four Kerala nuns, who campaigned against former Jalandhar Bishop Franco Mulakkal accused of sexually assaulting a nun in Kerala, have got reminder notices to “obey” their transfer orders issued by the Missionaries of Jesus Congregation. The nuns in Kerala had received their transfer orders in March 2018, months after they had complained at several forums within the church against the bishop, but they refused to report at the assigned convents. “Once again, let me make a decisive appeal to you to join the Chemiyari community without any further delay and take up your responsibility,” said the notice to one of the nuns. The letters accessed by NDTV has been signed by Jalandhar-based Missionaries of Jesus Congregation Superior General. “We feel this is an attempt to weaken the case against the bishop and pressurise the survivor nun. We will not go anywhere. If we all move away to different convents, it will be very difficult for her. We will stay here to support her,” one of the nuns told NDTV. Besides the reminder of transfer, the letter also disapproves of the nuns going against the congregation. “This communique is intended to remind you once again to recall my earlier appeals inviting your attention towards mending the current way of life and activities pursued by you… Even as you and a few other MJ members continue to feel no qualms in issuing malafied public statements and circulate baseless stories tarnishing the image of the MJ congregation and portraying the Mother General and other members as ‘enemies of those who are fighting for their justice’, I have been ensuring that the congregation continue supporting you,” it added. 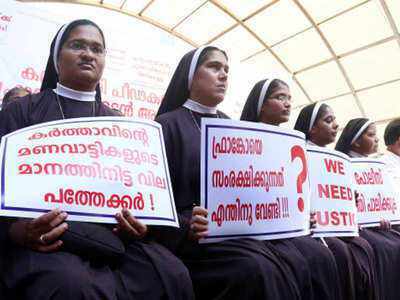 In September last year, the nuns had protested near Kerala High Court demanding justice for the nun, who had alleged that the Jalandhar Bishop sexually abused her 13 times between 2014 and 2016 during his visits to a convent in Kottayam district. After her complaint triggered protests, the bishop was arrested in September. Franco Mulakkal is currently on bail. A few days ago, another nun who published poems, bought a car and took part in a protest against Franco Mulakkal, was issued a notice by her superiors for indulging in anti-church activities and leading a life “against the principles of religious life”. The notice asked the nun to offer an explanation at the Generalate of the Congregation on January 9, but she did not turn up, saying that she was busy. “Through Facebook, channel discussions and articles, you belittled the Catholic leadership by making false accusations against it and tried to bring down the sacraments… you defamed the congregation and your performance through social media was culpable in causing grave scandal,” the notice read. It also termed getting a driving licence, buying a car on loan, and publishing a book without the permission of her superiors as “grave violations”.